This entry was posted on Sunday, January 13th, 2019 at 6:33 pm	and is filed under Uncategorized. You can follow any responses to this entry through the RSS 2.0 feed. You can leave a response, or trackback from your own site. Wow,wow,wow! I love everything about this photo. Especially the clarity of the photo itself and the contemplative look on the bird, against the muted background. As beautiful as an Audubon, and just as natural! Beautiful. 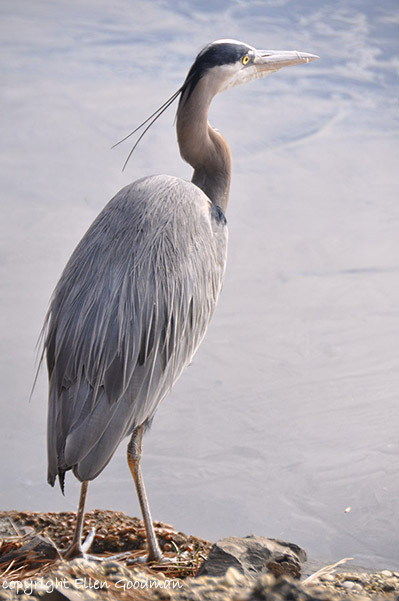 I, too, thought the majestic pose of the heron looked just like something from the Audubon Society, e.g., the clarity of the eye, the differentiated feathers. Very nice shot. What a beautiful shot! I love to stop and watch the blue heron in the park near my house. Magnificent bird captured in all his glory. Great shot. WOW, what a shot!!!! I can’t believe you were able to catch him just standing still! He has his own little personality – doesn’t it look like he’s thinking deep thoughts? Such a beautiful photo, so well done. Amazing shot. Study in blues and grays. What a magnificent bird and fantastic photograph. The details and the subtle complementary color scheme make this prize-worthy! Beautiful photo of a beautiful bird posed proudly against a similarly muted sky/lake? Thank you all. It was quite the adventure getting this shot. I was photographing the geese, ducks, and seagulls all around, and standing on, the mostly frozen lake, when I saw this huge mound at the edge. I didn’t realize what it was until I got pretty close, at which point it flew away. So we drove around the lake looking for it. I was in and out of the car half a dozen times. On the last stop, I inched my way closer to the heron, which had to be at least three feet tall, and snapped this shot. He flew away the second the shutter clicked, but I knew I had a keeper! Magnificent photo. I don’t know how you were able to capture the bird in such a stunningly beautiful pose.